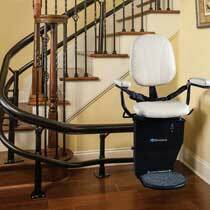 Our goal is to take all the risk and uncertainty out of your purchase of a stair lift in and around the Cleveland area. 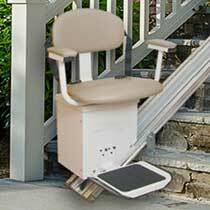 We understand a stair lift is a daily use device that has to work flawlessly for many years. Your need for a stair lift is personal. It may be to speed up your recovery from a knee or hip replacement, reduce the risk of a fall, escape from the pain of arthritis or to avoid heavy breathing or a racing heart when climbing your stairs. Whatever your reason, find out more about a quality stair lift and enjoy your entire home once again. Call Accessible Home Consultants of Cleveland, Ohio for professional assistance with your stair lift needs at (440) 871-5555. Battery powered operation with continuous charging from your regular 110V outlet household power. 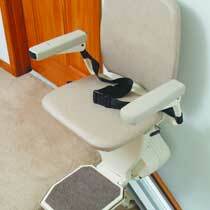 Swiveling seat for safe mounting and dismounting at the top of the stairs. Key switch to immobilize the lift whenever children are visiting. Choose a lift with a positive rack and pinion or worm drive system for long smooth-running lift life. Ensure the lift you buy has an Over speed governor and Safety gear to protect you in case of gearbox failure. This feature is important as an air bag in a car! A solid steel chassis with more than 8 guide rollers, our lifts have 12! Avoid cable driven lifts like the plague. Antiquated designs with cables should be outlawed. In our opinion, they are potentially unsafe. Ask about the folded dimensions of the stair lift. Any stair lift intruding more than 13" from the wall when folded will typically give other staircase users too little room to walk safely up and down the stairs. Demand a manufacturer's warranty that is honored. You can Google "stair lift complaint" and see who's are trustworthy. Avoid manufacturers that continually back out of their customer obligations. Yes, this is a real installation of an Outdoor Stair Lift! The design of a true outside model requires sound engineering and material selection. So many manufacturers simply charge 50% more, slip a plastic bag over the lift and call it their Outdoor model. Specially treated gear rack with stainless steel full size fixings for long life. UV stable carriage covers / enclosures. All fixings are high grade stainless steel. Sealed for life ball bearing ball races for ALL guide rollers. Hard anodized rail / track treatment to resist the elements. We always specify the most cost effective curved lift for our customers' needs. We have a range of makes and models to accommodate the more complex curving stairs. Inside bends and outside curves on the same track / rail are no problem for this design. Curved lifts should always have the same safety features as straight lifts.